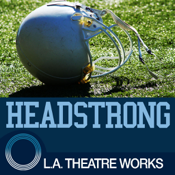 Headstrong (by Patrick Link) is presented by L.A. Theatre Works. This standalone audiobook app combines a professional audio recording with supplemental features for download-once, grab-and-go anywhere enjoyment. Includes an interview about brain injuries and sports with Dr. Robert Cantu, the Senior Advisor to the NFL Head, Neck, and Spine Committee. An L.A. Theatre Works full-cast performance featuring Deidrie Henry, Ernie Hudson, Ntare Guma Mbaho Mwine and Scott Wolf. DURATION: About a 1.25 hour performance.